Kits from Belarus. PST (PromSnabTorg, JSC, Minsk) produces plastic model kits of military vehicles of the World War II and post-War eras. Some of the soft skins are license produced AER kits (noted below), but most are original molds. PST has recently started a small line of vehicle accessories. 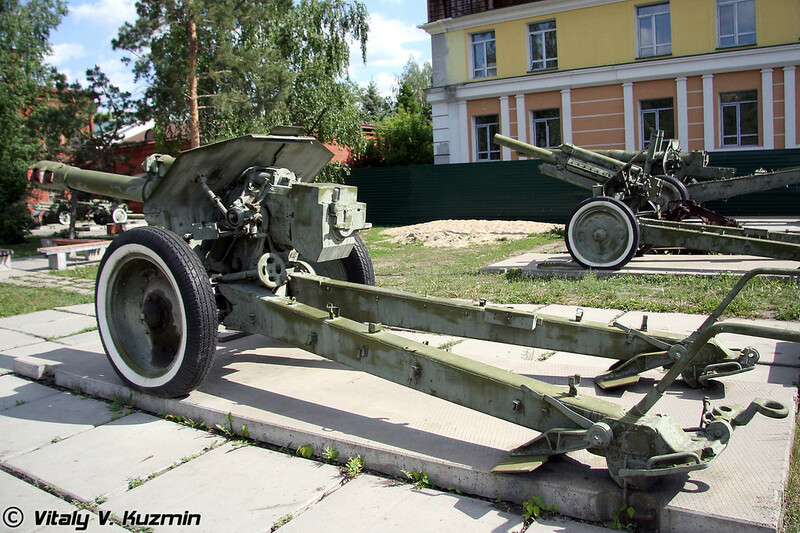 72004 ISU-152 Short-barrel 152mm howitzer. Same comments as above. 72007 ISU-152-1 Long-barrelled 152mm howitzer. Same comments as above. 72010 BM-13N Katiusha AER Studebaker kit plus sprue of new parts for rocket launcher. 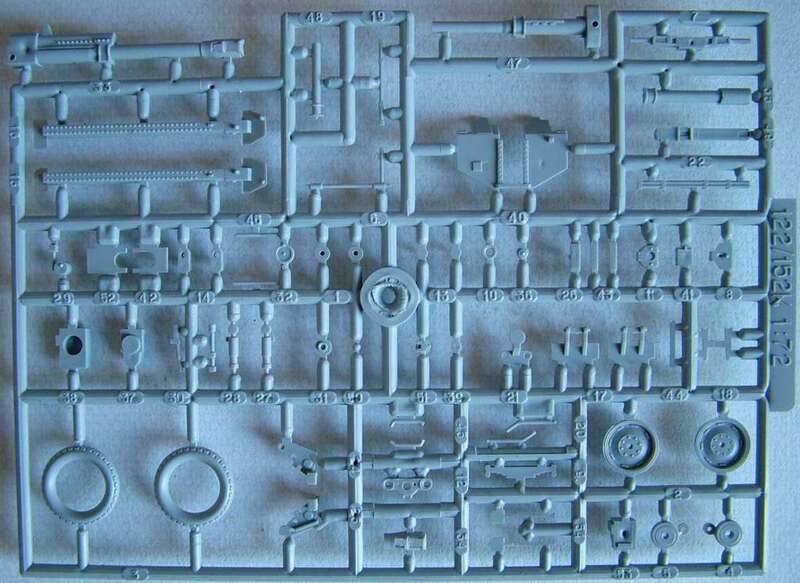 AER Zis-5 kit plus sprue of new parts for fuel tank. The builder needs to ignore the instructions about the engine cover. (Part 12 in this diagram, labeled differently in every one of the kits.) The direction is wrong. This is correct. 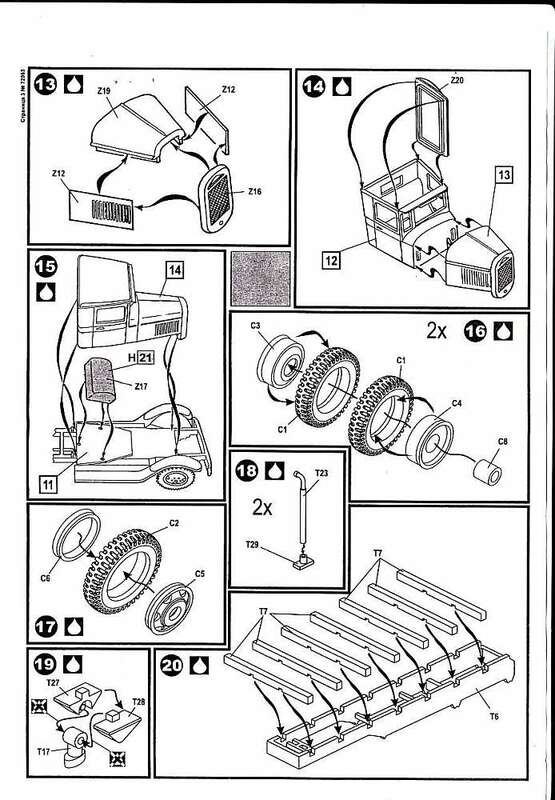 The painting instructions are correct, by the way, about the direction of the part. At any rate, it is clear, by the number of erroneous builds featured online, that the instructions have tripped many people up. 72018 M-13 Katiusha Same as AER and Eastern Express kits. 72019 Zis-6 Truck Same as AER and Eastern Express kits. 72020 BZ-35S Fuel Truck AER Studebaker kit plus sprue of new parts for fuel tank. 72021 BZ-35 Fuel Truck Same as AER and Eastern Express kits. 72023 PARM-1 Field Repair Truck Same as AER and Eastern Express kits. 72024 PARM-2 Field Repair Truck Same as AER and Eastern Express kits. Same as AER and Eastern Express kits, with added AA gun. Same as AER and Eastern Express kits. The kit share the same sprue for the D-1 and M-30. The gun can be built into either depending on the choice of the builder. It is not clear what the gun in the kit represents. The reader is highly encouraged to read up on the gun here. With respect to the M-30, it represents the early version of the M-30, with the early riveted legs (see parts 15 and 16). The problem, however, is that PST only made the rivets on top of the legs. There are no rivets on the side of the legs. To be accurate, you either duplicate the rivets on the side or shave off the top to make it the welded, late version. The big problem is this. Zvezda also has an early M-30. The features on the Zvezda look much better, despite the fact that it has much fewer parts. T he builder can always make the D-1, which isn't available from any other manufacturer as far as I can tell. But there is a problem. Most of the actual D-1 have the late sight. The only exception I have seen is possibly this museum piece. I don't know how interchangeable the sights are in real-life, but the builder needs to be very, very careful. 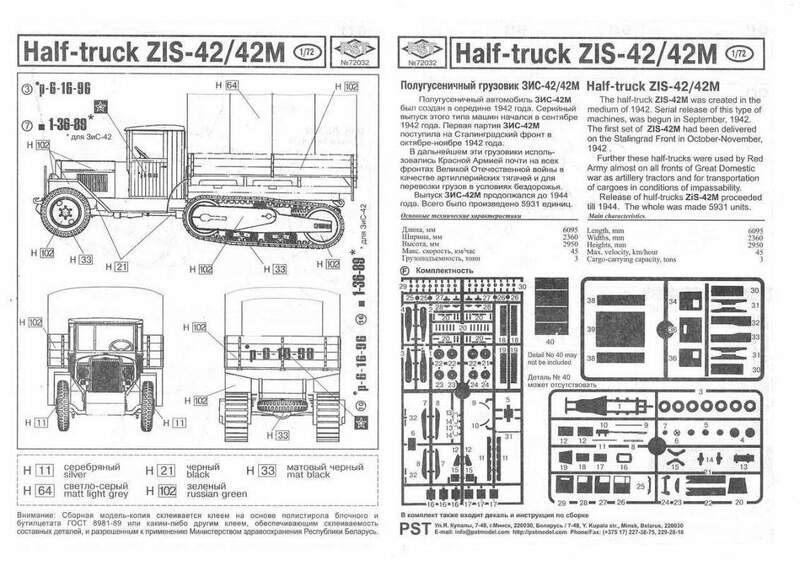 AER Zis-42 half-track with new injected plastic half-track parts, plus a sprue of parts for the D-1 howitzer. AER Zis-42 half-track with new injected plastic half-track parts. 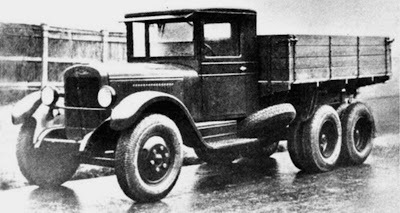 AER Zis-5V truck with new injected plastic half-track parts, and AA gun. 72039 IS-2MT Armored Recovery Vehicle Basically the same kit as the IS-2, but with no turret, and a few additional parts for this version. 72041 BN-13N Katiusha All new molds, based on Studebaker US6. 72042 BN-13 Katiusha All new molds, based on Studebaker US6. 72043 BZ-35S Fuel Truck All new molds, based on Studebaker US6. 72044 GMC CCW/CCKW 353 Cargo All new molds. 72056 M16A Truck Machineshop Built on US6 truck. 72057 M7 Small Arms Repair Truck Built on GMC truck. 72058 M14A Spare Parts Truck Built on Ford 6 truck. 72066 S-125 "Neva" Air defence missile system mounted on T-55 chassis. 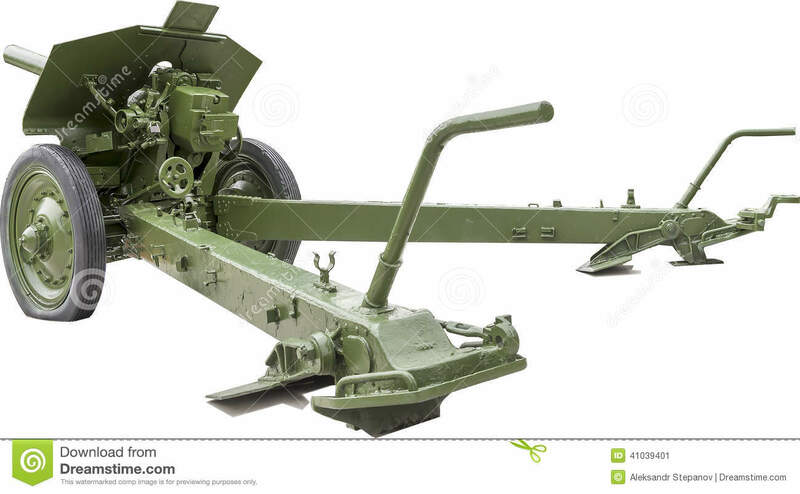 Fenders are for a T-44M/T-54, not a T-44 (ribbed strenghening at the front). They are also too high up. The turret won't turn because the fuel drums will get in the way. Been there, done that! Wrong hatch on the commander's cupola on turret - same problem in T-44M kit (kit no. 72067). It should be the single-hatch type. Horrible T-54 PST "thin rim" wheels. Better replaced with Revell T-34/85 wheels. Drive wheel has 6 lightening holes (T-34 style). The actual T-44 had a drive wheel with five lightening holes. Handles on fuel drums are at an odd angle. It looks like they've been taken from a T-34 kit without any correcting. Stowage box on front port side looks a bit too chunky.